Simply stated, Hy-Vee’s sustainability mission is to promote the well-being of our customers, employees, communities and the global environment. At Hy-Vee we see sustainability as part of our focus on healthy living, believing that healthy lifestyles and a healthy environment go hand-in-hand. Whether it is helping our customers make healthier choices or working to make the way we do business more sustainable, we see this effort as part of Hy-Vee’s overall mission of making people’s lives easier, healthier, and happier. Concrete floors: Concrete floors, which eliminate the need for additional floor coverings and reduce the need for cleaning chemicals. Recycled materials: Where possible, recycled materials are used in our steel structures, foundations and concrete wall panels. Energy efficiency: We specify Low-E windows and a highly reflective roof that reduce energy load in the summer help boost our stores’ energy performance. Water efficiency: Features such as native landscaping and motion-activated toilets and faucets are used to reduce water consumption. Lighting: Measures aimed at improving lighting efficiency include the increased use of natural light, high-efficiency LED store and parking lot lighting, and store lighting that adjusts to the time-of-day. Equipment: Highly efficient heating, air conditioning and refrigeration equipment decreases energy consumption while waste heat from this equipment is often-times used to preheat hot water and air. Transportation: We are working to improve the fuel efficiency of our trucking fleet through such measures as the use of fuel additives, alternate vehicle routing, and new engine, tire and trailer designs. Water consumption: We are working to better manage water consumption through a variety of store design and operational changes. These changes include motion-activated toilets and faucets, the use of native plants with reduced irrigation needs, and the use of rainwater harvesting. Refrigeration management: Our efforts to better manage refrigerants include investment in state-of-the-art technology that identifies and prevents leaks, and participation in EPA’s GreenChill Advanced Refrigeration Partnership. Diversion of food waste: We have committed to diverting food waste away from landfills, most commonly to compost at the vast majority of our stores. Store recycling: We are continuing work to increase recycling rates for store recyclables, including cardboard, plastic, paper and cooking grease. Plastic bag recycling: All stores provide recycle bins so customers can return their plastic shopping, newspaper, and dry cleaning bags for recycling. Products: Increasingly stores are converting to pre-trimmed produce and pre-packaged meat, reducing waste and transportation-related energy use. Natural, organic, and locally sourced products: Hy-Vee has a vast assortment of natural, organic, and locally sourced products. We know it’s important for our customers to know where their food comes from so we have invested in bringing the very best of these products to our stores. Shopping bags: Responsible use of shopping bags is another way we reduce the stress we put on the planet. Towards this end, Hy-Vee is: (1) working with our employees to reduce the use of paper and plastic bags, (2) encouraging customers to recycle plastic bags at our stores, and (3) striving to increase our customers’ use of reusable bags. One-Step Products - Hy-Vee developed the One Step series of products with a simple mission: To offer customers a selection of products for which the proceeds go to relevant worthy causes. One Step products include a 5 pound bag of russet potatoes, shredded wheat cereal, paper towels, and bottled water. Packaging: We are also working with other retailers to reduce packaging on branded products and pursuing more efficient packaging for private label products. 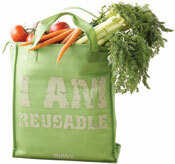 Reduce waste by toting groceries home in a reusable bag. According to The Wall Street Journal, the U.S. goes through 100 billion plastic shopping bags annually. Now you can help by choosing to use a reusable bag. Our reusable bags come in a variety of styles and colors, including a bag lined with a special insulation to keep food cold or hot during transport. Hy-Vee also provides plastic bag recycling for our customers. Please bring your plastic shopping, newspaper, and dry cleaning bags back to Hy-Vee to be recycled appropriately. Encouraging purchases of recycled plastic equipment through a grant program for parks and schools. Hy-Vee is working to make it easier for those who have chosen electric vehicles as their preferred mode of transportation. Partnering with ChargePoint and Tesla, Hy-Vee now has electric vehicle (EV) charging stations at locations in throughout our eight-state area. For more information on locations to charge your electric vehicle, please go to the US Department of Energy's Alternative Fuels Data Center website.